Design students Alex Cabunoc and Ji A You visited Cerro Verde, a slum outside of Lima, Peru, as part of a challenge from the Design Matters program at Art Center College of Design, which focuses on social innovation. One of the many ideas that came out of the trip is GiraDora, the foot-powered washing machine. 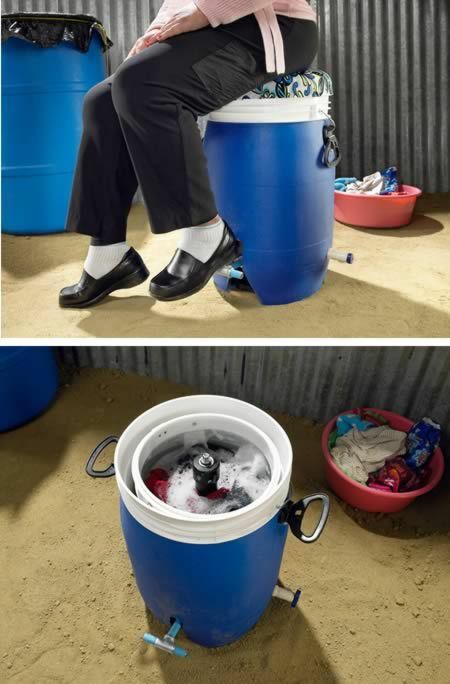 GiraDora is a blue bucket that conceals a spinning mechanism that washes clothes and then partially dries them. It’s operated by a foot pedal, while the user sits on the lid to stabilize the rapidly churning contents. Sitting alleviates lower-back pain associated with hand-washing clothes, and frees up the washer to pursue other tasks. It’s portable, so it can be placed nearby a water source, or even inside on a rainy day. It reduces health risks like joint problems, skin irritation, and mold inhalation. Most importantly, it uses far less water and cleans clothes faster than conventional hand-washing. The 11.5ft-long Scubster Pedal-powered Submarine is definitely a cool underwater toy. 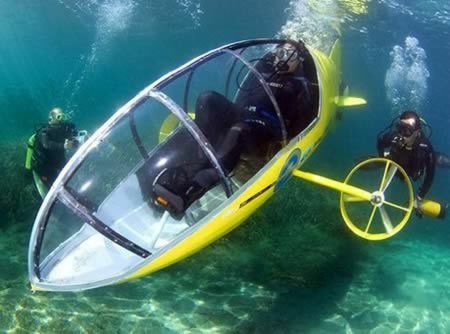 This mini-sub, nicknamed the "Scubster", runs on your pedaling power, like a bike, and features a pedal belt connected to a twin-propeller system so you can crank up speeds up to 5mph. The Scubster can currently reach depths of 6 meters (20 ft) which is great for rivers, lakes, and shallow ocean exploration. Full diving gear is needed though, since there is no on-board oxygen. 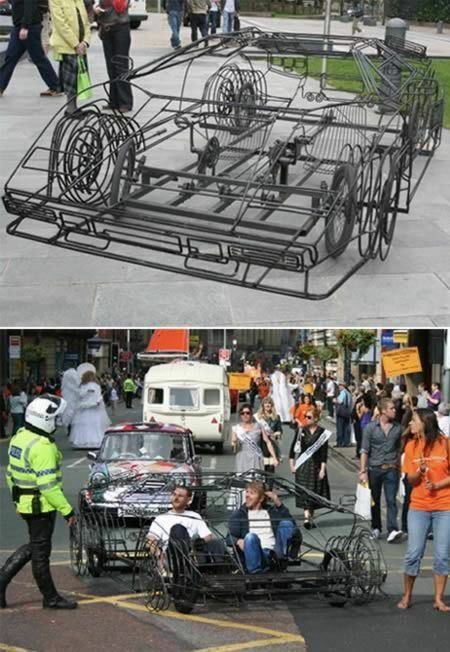 This Lamborghini made out of wire was shown off at the Art Car Parade in Manchester in 2007. The two guys behind it, sculptor Benedict Radcliffe and pedal car designer Ben Wilson, even managed to get the attention of a British cop. This was probably the first time a Lambo has been ticketed for going too slow. This looks like an interesting way to travel. 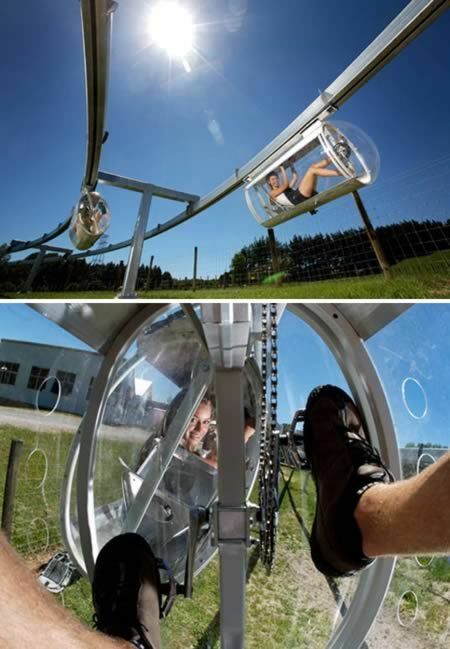 The Shweeb is a self-enclosed, pedal-powered personal pod already in use at an amusement park in New Zealand. A team of designers see the Schweeb not only as a vehicle of amusement, but as an environmentally-friendly replacement for personal motor vehicles in traffic congested cities. The Schweeb uses a monorail system to guide users along a pre-determined path, and each pod is powered by the rider. According to their website, it takes only half the energy of a regular bike and 1/3 the energy of a mountain bike to pedal, since it is enclosed and there is no rolling resistance of the tires to compensate for. For even greater efficiency, Schweebs can be linked together for less air resistance, and more pedal power. 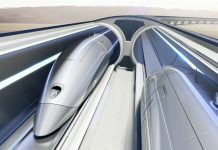 This pod can easily attain speeds of up to 31 mph (50 kph). Just to compare, the average speed in London of a car is just 8 mph, the same speed it was a 100 years ago in 1908. 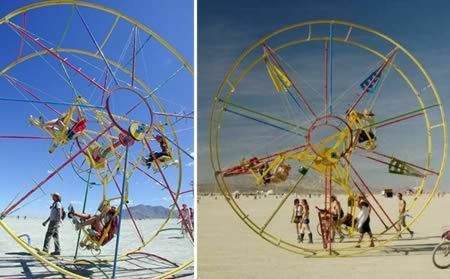 The Human Powered Ferris Wheel, otherwise called the Star Wheel, is a device created by Paul Cesewski. The contraption weighs 2000 pounds and reaches 22 feet into the air. There are 3 seats inside the wheel and each passenger has their own set of peddles. As you cycle inside the wheel, you’re driving yourself around the inside of the wheel. Gravity then causes the outer wheel to also move forward. The device is not particularly stable. However, the original design was for just 2 seats inside the wheel, and cycling pushed the 2 passengers around inside. Cesewski thought that was too dull, hence adding the movement of the outer wheel too! The total build cost an impressive $7000 and took a total of 6 months to design and create. The great thing, though, is no diesel engines are needed to run the contraption. If he could make it more stable, it might catch on! 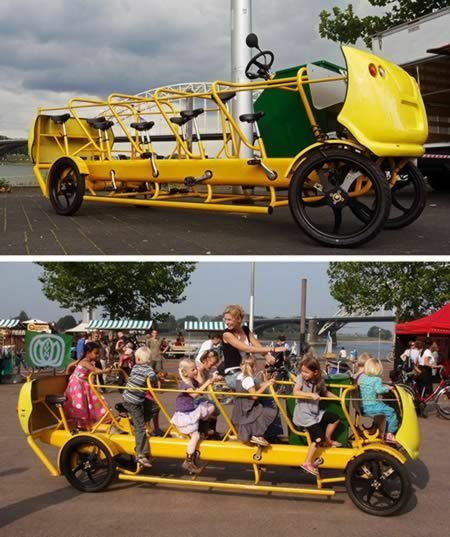 Pedal Powered School Bus made in the Netherlands by De Café Racer. As I get ready to start cooking, I can’t help but wonder if I’m missing out by not having Christoph Thetard’s foot-pedal-powered kitchen appliance at my disposal. A giant pedal-powered flywheel generates enough energy to operate assorted attachments: a blender, a coffee grinder and a “kitchen machine” (which appears to be approximately equivalent to a food processor). The flywheel is housed in a beautifully crafted wooden frame, which also includes compartments to store the attachments when they’re not in use. Student designer Thetard’s objective for this product — which is still just a concept — is to reduce electricity use in the kitchen and therefore help us reduce our personal carbon footprint. 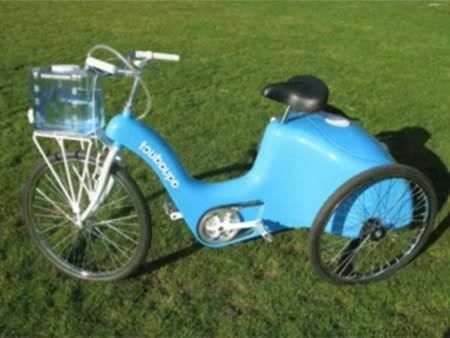 A uniquely designed bike with three wheels that purifies water by using the energy generated from pedaling it. From the “too cool for school” department, comes this new Japanese roller coaster that is powered by humans. It’s called the Skycycle, and it’s a pedal-powered rollercoaster that allows people to “shoot for the sky” as they ride side-by-side in bike-themed carts. 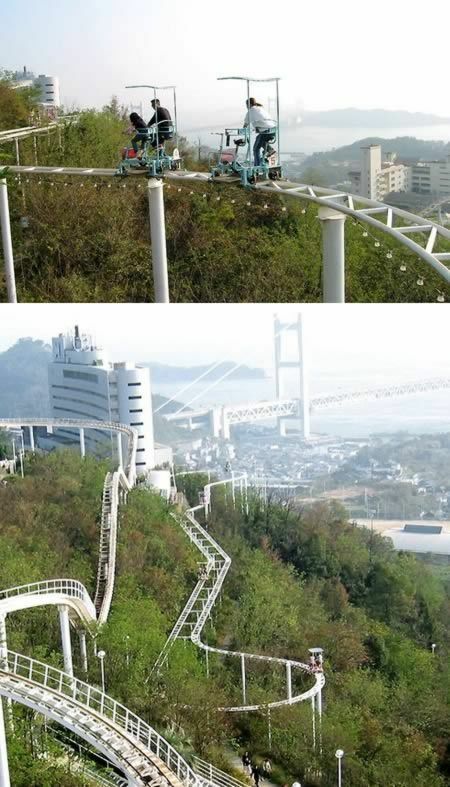 The Skycycle is one of the most thrilling amusement park rides at Washuzan Highland Park in Okayama, Japan. Lots of kids wish they could build an airplane and fly away, but Dutch teenager Jesse van Kuijk has become one of the rare few to make it happen with his pedal-powered plane made out of balsa wood, polyurethane, and rip-resistant foil. The most impressive part? Van Kuijk built his plane without ever having flown in one before! 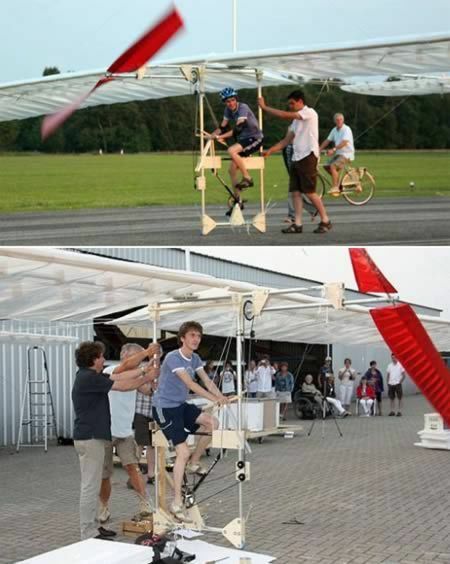 The Dutchman’s project began in 2006, when van Kuijk started researching pedal-powered planes, including the Gossamer Condor (the first pedal-powered plane to fly a figure-8) and the Gossamer Albatross (the first pedal-powered flight over the English channel). 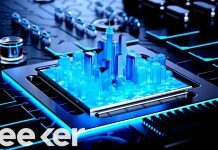 Over the next few years, the inventor gathered materials and eventually built a plane with 85 foot-wide wings and a bicycle chain attached to a propeller for acceleration. Van Kuijk’s maiden flight last Sunday didn’t go very far–the plane flew 15 feet in the air for a distance of about 45 feet–but eventually he hopes to make an extended journey. That’s not out of the realm of possibility, as van Kuijk is only 19 years old and he built his first plane without constructing a model.